Asher B. Durand was commissioned to paint this magnificent vista overlooking the Genesee River Valley in Geneseo, New York, by a member of the Wadsworth family, the village founders. At one time, they owned all the land from Geneseo to Rochester. No matter what the weather, this view across the Genesee Valley near Geneseo is as breathtaking now as it was over two hundred years ago, when landowner James S. Wadsworth commissioned Hudson River school founder Asher B. Durand to record the beauty of the landscape in a painting. In the summer of 1859, Durand traveled from New York City to the Genesee Valley to make preparatory sketches. Trained as an engraver, he recorded many of the details that he saw, but in addition, his personal belief in the immanence of the divine in the natural world motivated him to present a landscape that seems to extend infinitely. 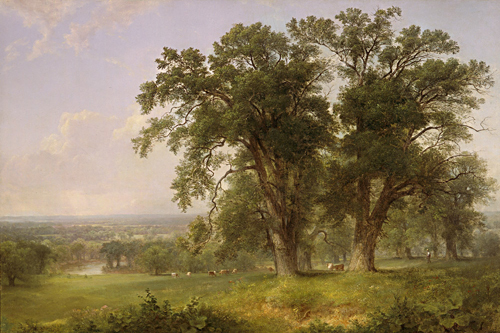 Statuesque oak trees, many of which are still standing on the land, dominate the painting. In this region, the trees were more than a decorative feature. When the Wadsworths began to sell and lease land to local farmers, they included a clause in the contract requiring that a number of trees remain after the land was cleared. This was a holdover from British husbandry; the result was a countryside that was not only beautiful but that provided sun and moisture control for humans and animals alike. Genesee Oaks was Durand's tribute to the splendor of this valley. Durand visited the Genesee country but once, sketching in the Geneseo area during late June and July of 1859. Of his trip he wrote to his son in August: "With all my troubles I believe I have learnt more about the management of colors in the painting of trees than by all my previous practice, altho' I have never produced so little in the same span of time, not having made but four studies in five weeks." During the following year, back in his studio, Durand painted Genesee Oaks, based on the sketches he had made. The painting was commissioned by James Samuel Wadsworth, a local squire, who owned the work when it was exhibited at the National Academy of Design in 1861. Seven oil studies done near Geneseo in 1859 are photographed in Durand's studio after 1878. A photograph shows three small sculptures of cows, two standing, one reclining that may have served as models for the animals in the painting. Peters, Susan Dodge, ed. Memorial Art Gallery: An Introduction to the Collection. (Rochester, NY: The Memorial Art Gallery, 1988). p.182-3.